We spent the Christmas Holidays in Santa Monica and Las Vegas this year. My son was turning 40 and he couldn't decide what he wanted to do. They are all in Las Vegas. 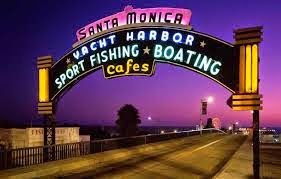 I have always loved Santa Monica and have never really been to Las Vegas. It always seemed a little icky to me. Here is my version of it. You can google it by searching Michael Osborne and Family do Las Vegas. The Fireworks at the end are pretty cool.